I just finished eating one of these and I decided to look up the product online and it brought me to your website. 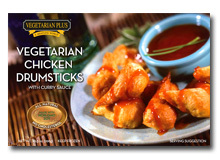 I am trying to go "meatless" as well and I absolutely love these drumsticks. I made the mistake of putting them in the microwave the first time and they looked AWFUL, but instead of eating them I put the oven on broil and heated them up that way. The skin became crunchy and golden brown and the result was amazing! I really enjoy this product, but I certainly understand where you are coming from, they SHOULD NOT be microwaved at all! I tried these back in the day with my ex boyfriend. While they were cooking we were like "wow thats a really familiar noxious smell" then we bit into them, realized they smelled like the fetal pigs we dissected in biology class. Promptly spit them out and disposed of them properly. Never again. These, along with almost all fake meats, are just terrible in the microwave. Then again, so is real meat. The "tofu skin" probably refers to yuba, aka bean curd sheets. It's these really thin sheets of tofu, created by skimming off the top of soy milk as it's being turned into tofu. Sort of like pudding skin! Some Chinese restaurants have yuba on the menu. They put together like a hundred layers of it, then fry it so the outside is crispy, then slice and put in sauce. Really great chewy texture, not trying to replicate any specific meat. If you ever see it on a menu, you should try it! I found a paleo friendly vegan Chicken skin alternative. That has been the closest thing taste wise. There is such a thing as tofu skin, stop in an Asian market you will find it there. Bless you!